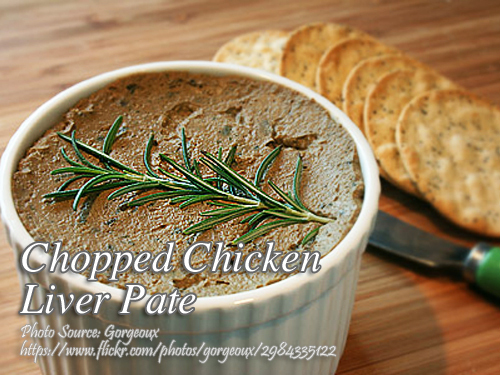 This is a chicken liver pate recipe that is very easy to make. Since duck liver pate is very expensive, you can imitate it by replacing it with chicken liver. On the recipe I didn’t specify the amount of time sauteing the chicken liver. It’s up to you to decide what doneness you think is acceptable. But just don’t over cook it because it will become too tough. To cook chopped chicken liver pate; In a frying pan, saute onions and chicken liver in butter. Chop the cooked chicken livers and combine with onion, egg white, seasonings, MSG, and red wine. Mix thoroughly. Chill for about 30 minutes. Press into a well oiled mold and remove from mold at once to serving plate. Garnish the plate with chopped egg yolks. In a frying pan, saute onions and chicken liver in butter until cooked. Chop the cooked chicken livers and combine with onion, egg white, seasonings, MSG, and red wine. Mix thoroughly. Chill for about 30 minutes. Press into a well oiled mold and remove from mold and transfer to a serving plate. Garnish the plate with chopped egg yolks. Good for 4 persons. my apologies. English is my second language.